As you all are well aware, on the fourth day of the sixth Tibetan month (31 July 2014), the Yangsi (reincarnation) of our beloved guru, His Holiness Pema Norbu Rinpoche, will be enthroned upon the fearless and majestic golden lion throne with an auspicious grand ceremony at Palyul Monastery, Tibet. We believe that this enthronement ceremony is a historic moment for all the students of His Holiness, an extremely auspicious occasion that will never happen again. His Holiness had dedicated his entire life for the benefit of all sentient beings and the Buddha’s teachings in general and, particularly, to his tireless and unfathomable activities to benefit us, the students, in all aspects, temporal and ultimate; on all levels, individual and community, they were outstanding, all-encompassing, and phenomenal. The great kindness that springs from his vast compassion cannot be repaid even if we were to fill the entire three thousandfold world system with gold. 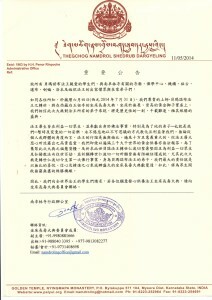 However, in order to gather the two accumulations and also as an auspicious circumstance for our Yangsi Rinpoche’s precious life to remain firm for a hundred kalpas for the benefit of all sentient beings and the teachings, as well as to ensure that all his noble aspirations will be fulfilled without any hindrance, and specifically, since the enthronement ceremony will be the first enlightened activity of Yangsi Rinpoche, it is the utmost responsibility of all the students of His Holiness Pema Norbu Rinpoche—the Palyul Namdroling mandala worldwide—to make a Grand Tenshug (long life offering) with great joy, faith, and enthusiasm as this will open up the door to unlimited opportunities of auspiciousness for all. Therefore, we request all the students throughout the world who want to make a contribution for the tenshug to kindly contact the Tenshug Organizing Committee. 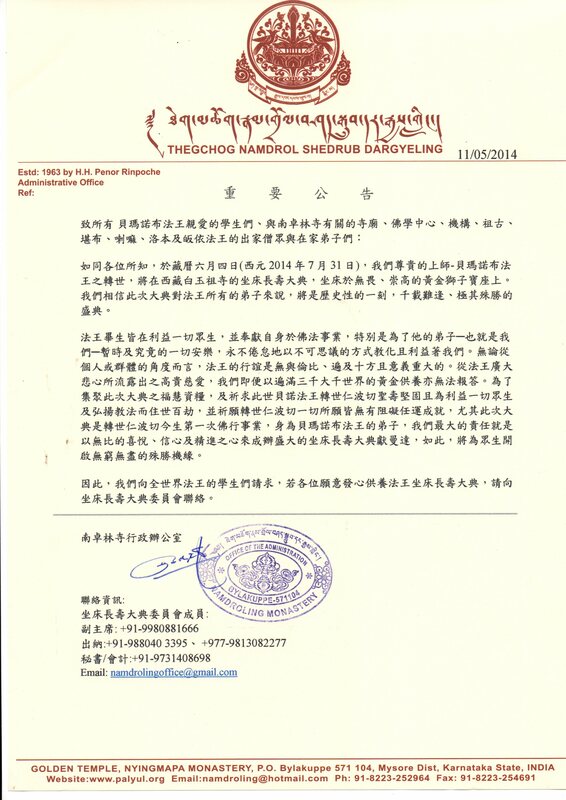 This entry was posted on Sunday, May 11th, 2014 at 20:38	and is filed under His Holiness Penor Rinpoche, Yangsi. You can follow any responses to this entry through the RSS 2.0 feed. Both comments and pings are currently closed.